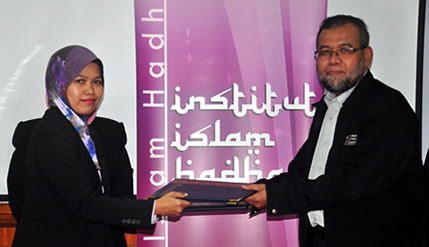 BANGI, 16 Nov 2012 – The National University of Malaysia (UKM) Islamic Hadhari Institute and Quira One Production are to collaborate to produce a 13 episode documentary to educate the people on science from the Islamic perspective and Islam from the scientific perspective. A Letter of Intent for the cooperation was signed here last week by Hadhari’s Director, Prof Dato’ Dr Mohd Yusof Othman and Quira’s Head, Siti Norhayza Mohd Ali. It was witnessed by Hadhari’s Deputy Director, Prof Dr Jawiah Dakir and Quiara Film Director, Nahar Akbar. Prof Yusof said with expertise available in various disciplines at UKM, Hadhari felt responsible to educate society on scientific phenomena from the Islamic perspective through a popular medium. It also shows the Institute’s desire to avail development of the new media to educate the public on the subject through the documentary that can entertain the people while providing them with information on natural phenomena. Quira on its part felt that there was a dearth of such informative films that explained various natural phenomena from the Islamic perspective and had chosen UKM as its partner due to the availability of experts on the subject in the university. It hopes to get the series run in various tv channels both at home and overseas. It gave a preview of the first episode of the series titled “Lawn al-Hayah” to get feedback from the audience at the signing ceremony. The film featured Dr Mohd Fadly Abdul Rahim from the Faculty of Sains and Technology and Dr Wan Nasyarudin Wan Abdullah from the Faculty of Islamic Studies of UKM giving their take on the subject which was filmed at Tanjung Tuan Malacca. Both Prof Yusof and Norhayza hoped their collaboration can be continued in the production of documentaries.